710 Study San Rafael Neighborhood Posts: Will Los Angeles Ever Get a Bike Share Program? DOWNTOWN LOS ANGELES - Last December, people cheered when the City Council approved a plan to create a bicycle-sharing program in Los Angeles. Downtowners were particularly excited, looking forward to a day when commuters could take a train to Union Station or a subway stop, then rent a bicycle for a short trip to their office, leaving the two-wheeler at a central rack. In April, an official with the Irvine-based company Bike Nation, which was chosen to implement the plan, told Los Angeles Downtown News that as many as 10 stations holding three-speed, chainless bikes could be up the following month. The plan called for eventually having 125 stations in Downtown and 400 across Los Angeles. Even better: The program wouldn’t cost the city a dime, with Bike Nation making its money on advertising. Now, nearly a year after the plan was announced, it looks to be dead, killed by a cumbersome permitting process and complications over the advertising plan. Officials have begun pedaling toward a different bike share program, though when it arrives is unknown. The Metropolitan Transportation Authority Board of Directors last week approved a motion to conduct a review of the bike share industry and find a vendor for Los Angeles County. The results of the study will be presented to the board in January, along with recommendations on how to proceed with the selection process. No date for implementation has been announced. The motion was authored by Mayor Eric Garcetti’s office in conjunction with county supervisors Zev Yaroslavsky and Don Knabe, among others. The motion intends to give momentum to a regional bike share network, but the problem that snagged Bike Nation’s plan continues to cloud any future deal: A city contract with JCDecaux and CBS Outdoor gives them exclusive rights until 2021 to advertise on “street furniture,” a term that includes not just bus stops and newsstands, but bike kiosks. This means the 400 racks slated for the city would be off limits; Bike Nation, or any other bike share vendor, could only place ads on the bicycles themselves. The advertising policy stands in contrast to that of New York City, which this year unveiled its privately owned CitiBike program, and of Washington D.C., which has Capital Bikeshare. Bike Nation Chief Operating Officer Derek Fretheim says the inability to advertise “critically devalues” any bike share operator’s real estate. 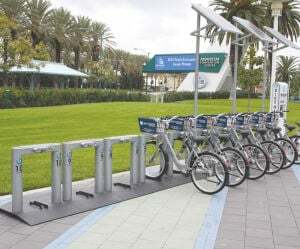 The company is now focusing on bike share programs in Long Beach and Fullerton, cities that do not have restrictions on street furniture advertising. “We love Los Angeles and want to install bike share, but we already offered it at no cost to the city. Without advertising, there’s no revenue stream to support it,” Fretheim said. The Bike Nation proposal was geared primarily toward people who need two-wheeled transportation for a relatively short time or trip. Plans called for charging users $6 to access a bike for 24 hours, with additional fees for any ride longer than 30 minutes. Another option was a $75 annual fee. Bike Nation racks would have been placed in areas that did not block the public right-of-way. Tracking systems would have been installed to prevent theft of the two-wheelers. It remains unclear whether the city can alter the existing contract with CBS/JCDecaux or how it might impact the countywide bike share strategy. Several city departments, including the Bureau of Street Services and the Department of Transportation, were not able to comment. Fretheim said he has not yet been contacted with any information about a regional approach. Another potential hurdle is that although the motion refers to a search for a single vendor for the county, Metro says that the involvement of several municipalities means that multiple bike share operators might be needed. Fretheim said this could be problematic if different operators and cities need to coordinate different technologies. Metro Executive Officer for Transportation and Implementation Diego Cardoso says that his biggest concern is ensuring proper communication between municipalities to ensure there are no long-term conflicts from short-term decisions. “We need to have the policy people understand what bike share is, how to successfully implement it, who they have to deal with so that we’re all on the same page,” he said. As those and other issues are worked out, Downtown commuters have to figure out other ways to get from Union Station or a subway stop to the heart of the community.